Free HTML to PDF Converter doesn't require Adobe Acrobat Reader installed. Free HTML to PDF Converter doesn't depend on any print driver so it will not install any print driver on your computer. Free HTML to PDF Converter works on Windows XP, Windows Vista, Windows 7 and Windows 10, both 32-bit and 64-bit versions. Click the download button above to download Free HTML to PDF Converter full version. Full version means the file is complete and doesn't require other PDF software, plug-in or printer to run. Full version also means Free HTML to PDF Converter software doesn't have any watermark, nag screen, time expiration or function limitations. Easy to use - A couple of clicks to finish PDF converting. Free HTML to PDF Converter - Convert HTM, HTML, XHTML document (*.htm, *.html, *.xhtml) to PDF file. Free website to PDF Converter - Download website (for example: http://www.yahoo.com) and convert webpages to PDF file. 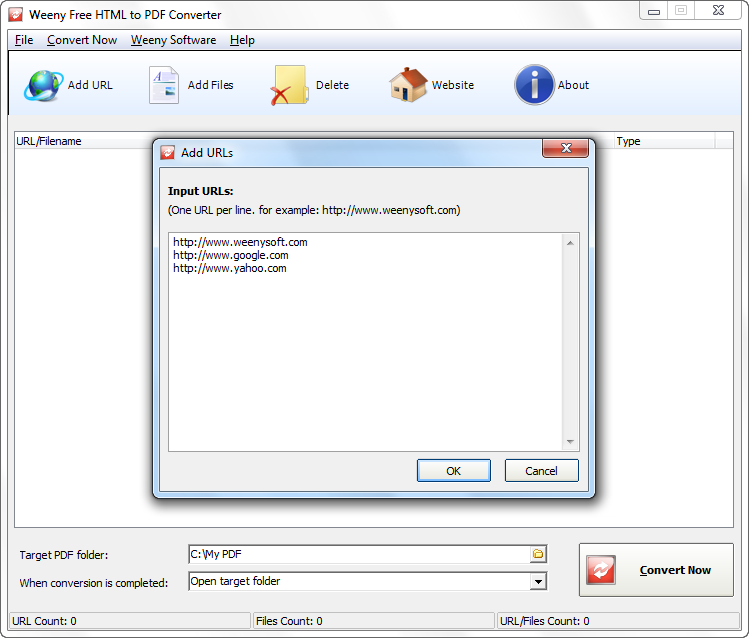 Free XML to PDF Converter - Convert XML document (*.xml) to PDF file. Free Text to PDF Converter - Convert Text document (*.txt) to PDF file. 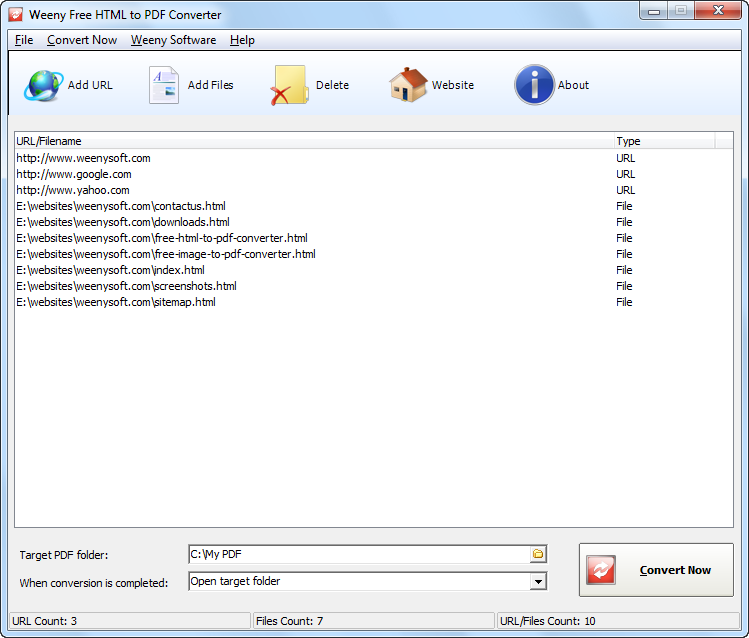 Batch convert - Weeny Free HTML to PDF Converter determines the input is local file or URL and use correlative engine to batch convert files/URLs to PDF files. Stand-alone software - Doesn't require any print driver or Adobe Acrobat Reader software installed. PDF file format is better known for its portability and security. You can take any type of data document in PDF files. Only think you need is a good converter to convert the files into PDF files. Weeny Free HTML to PDF Converter is a small free software to convert any webpage into PDF files. Doing business with HTML files is daunting task. You have to deal with lots of small files which often tends to takes long time to copy from one medium to another. Secondly they are virus prone and there is always risk of getting infected by malware if you take them to infected computer. That's not the case if you have PDF version of the same file. PDFs are lite, packed in single file and could be open in all PDF application without any issue. No matter where you open the file, it will never get infected with any viruses or malware until you edit it yourself. Weeny Free HTML to PDF Converter is an freeware software to create PDF files of Webpages. It does so in simple way. You have to specify either web address of the page or select downloaded file. And it will make its PDF version with exact content and look. Free HTML to PDF Converter is, just as its name suggests, a tool for saving HTML files to the PDF. These can be local HTML files or what web pages you like. And if you specify multiple files or URLs, the program can convert all of them in a single operation, leaving you with PDF files containing the same clickable links as the HTML originals. And the conversion is carried out very simply, by a single executable installed as a part of the Weeny Free HTML to PDF Converter setup process. I successfully installed the program by unticking the stuff I did not want. I did try some other free progs after sending you the email but none of them made pdf files with hyperlinks. Yours is the only one that does so good on you. "great fast and good convertion of webpage"
Summary: Look no further ... this program does what it shoud do and it does it quite well. Convert any web page in a pdf document with embedded images. Love the ease and simplicity of the program. No cons that I could find. If you'd like to create PDF files on your own PC then the standard route is to install something like PDF Printer. This adds a virtual printer driver to your system, and so whenever you want to convert a document to PDF, all you have to do is choose the Print option in a program, select that driver, then wait for the file to appear. The strength of this approach is that it works with just about any application. But the weakness is that the finished results can be poor, especially with web pages, where you'll often lose formatting and links will no longer be clickable. So if you need the best quality HTML conversion, you may prefer a specialist tool, such as Weeny Free HTML to PDF Converter. To use the program you must first point it at the URLs or local files (HTML, XML or TXT) which you'd like to convert. Batch processing isn't a problem, so feel free to add as many as you need. Note, though, despite the authors saying the program can convert websites, it actually only works with the page you specify (it won't follow all the links on www.mysite.com to create a page for each one). And with the pages added, all you have to do is click "Convert Now", and Weeny Free HTML to PDF Converter will immediately go to work on your specified files. If you were hoping to have detailed control over the low-level aspects of your final PDF then this could be a disappointment. You can't set your PDF metadata here, there are no options to add watermarks, control image settings, add fonts, configure your document security or anything else. On the other hand, it does at least make the program quick and easy to use. And better still, we found the final PDF files did a really good job of preserving the original web page format. Content almost always stayed in its original place (sidebars weren't added as an afterthought at the end of the main document), and text-based links remained active and clickable in the finished document. What's more, we found Weeny Free HTML to PDF Converter made good use of PDF bookmarks. When we tried saving www.softwarecrew.com, for instance, the program not only saved the HTML code, it also identified various sections -- "Most Popular Posts", "Latest Reviews", "Latest Comments" and more – and added bookmarks to them. Just clicking one of these later, when you're reviewing the file, and you'll jump straight to that area of the page. Weeny Free HTML to PDF Converter is very basic, then. It only converts a few document types, and doesn't give you any control whatsoever over how the conversion process works. There's no doubt that the program does handle the core HTML to PDF conversion very well, though, and if that's something you'd like to do regularly -- and you're not happy with the standard PDF creators – then we'd recommend you check it out. Sometimes you may need to get away from it all and just relax. How about a cabin near a lake with nothing around for miles? No telephone, no cell service and no Internet access. Well, if you are as connected as I am, I would still like to be able to read some research now and then during that week or two-week vacation. Yes, you can print some web pages to a PDF file and read it later. Unless they have some easy print buttons like Print Friendly for a printer-friendly output, you may wind up with skewed layouts blank pages or a plethora of pages with just an advertisement on them, you may just get frustrated later when trying to read the PDFs. You may want to check out Weeny Free HTML to PDF Converter. The Weeny Free HTML to PDF Converter lives up to its name by taking up a "teeny-weeny" bit of space. It has a layout similar to the Windows Explorer file manager. Just drag and drop all your URLs into the window and do a batch convert. When conversion is completed, you are ready to load the generated PDF on your tablet or E-Reader or just take your laptop with you for your reading pleasure. By the way, several other formats can be converted along with your web links. Just copy your HTML, XML and text files into the Weeny Free HTML to PDF Converter and they will be incorporated into the PDF for you. You can get the Weeny Free HTML to PDF Converter by going to their web site www.weenysoft.com. The best thing is that it is free and you don't have to buy any "full version" like other free programs offer. All functionality is there. Saving webpages for offline viewing is nothing new. Almost all web browsers allow this functionality via letting you store web pages in HTML format, albeit also creating additional folders to store pertaining scripts, images, files and related content during the process. Even though offline HTML pages allow you to navigate just like you would while you're actually online, this isn't always a solution. If you're looking for a way to simply store the web page – for instance a page consisting of an article that you want to read later – it's better to save it in PDF format instead. 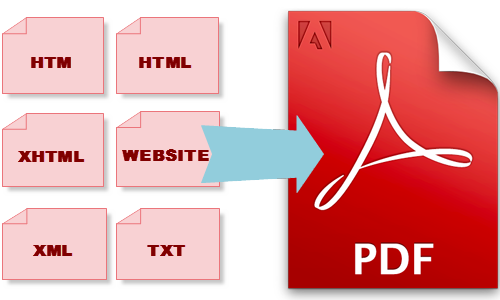 One of the advantages of PDF is that you don't have to keep multiple files akin to HTML. To quickly Xerox a webpage into PDF, try locking your sights on Weeny Free HTML To PDF Converter. It's a lightweight yet powerful software that automatically converts and saves a web page into PDF at a breakneck speed. You can either convert an existing HTML file, or try entering the website's URL and the tool takes care of the rest. The tool might look simple on the surface with a plain and user-friendly UI, but it does flawlessly what it's built for. The main window displays the list of URLs or files that you queue up prior to conversion. To the upper side of the window, there are navigation buttons for Add URL, Add Files, Delete, Website and About. As stated earlier, there are two ways to convert pages: by adding files or URLs. Batch conversion is also supported, which simply saves a lot of time. To convert existing files, simply click Add Files and then browse to your input directory. Apart from HTML, it also enables you to convert XHTML, HTM, XML and TXT items. The Add URLs option is rather interesting and more useful. All you have to do select this option from the main window and then enter the URLs (one URL per line, as stated in the tool itself). Once you have added the URLs, click OK, followed by "Convert Now" to begin the process. All in all, Weeny Free HTML To PDF Converter is an excellent software that does one thing and does it well. It works on Windows XP, Windows Vista, Windows 7 and Windows 8, both 32-bit and 64-bit versions. Testing was carried out on Windows 8 Pro, 64-bit.